Happy Valentine’s Day! 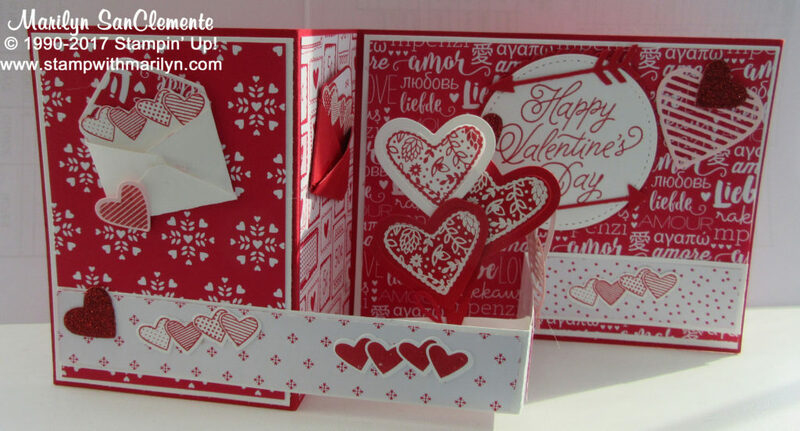 Today I am sharing a Double Z Fold Card that I made for a Valentine’s Day class that I was teaching. This card uses the Sending Love Suite of Products from Stampin’ up! The stamp set is Sealed with Love from Stampin’ Up! which is part of the Sealed with Love Bundle (144705). Don’t forget that you save 10% by purchasing the stamp set and coordinating famelits together! The Designer paper is the Sending Love Designer paper (142733) which coordinates with Real Red and Whisper White cardstock. So the details on this Z fold card… Warning that this card is not a quick card. There are a lot of moving parts and it does take some time to assemble. But they are beautiful when they are done! The card base is a piece of Real Red cardstock cut to 4 1/4″ x 11″ scored at 3″ and 5 1/2″. The first panel has a 2 3/4″ x 4″ piece of Sending Love Designer paper layered on a 2 7/8″ x 4 1/8″ piece of whisper white cardstock. The middle panel is a different piece of the designer paper cut to 2 3/8″ x 4 1/8″. The 3rd panel is cut to 4″ x 5 1/4″ layered on a piece of whisper white cardstock cut to 4 1/8″x 5 3/8″. The piece that makes this card fun is the front piece that makes the Z Fold. This is a piece of Whisper White cardstock cut to 1″ x 11″ scored at 3″ and 5 1/2″. The key to this piece is you fold it in the same Z pattern but attach it in the opposite direction. The end of the 5 1/2″ piece is attached to the front 3″ panel and the 3″ piece is attached to the 5 1/2″ panel. Warning: Make sure to fold your card before you go any further to make sure the fold works correctly. The front panel is decorated with a couple of 7/8″ pieces of the Sending Love Designer paper. Now the fun part! Stamping all the embellishments and you can go crazy with this! I used Real Red ink with Whisper White cardstock to stamp the Happy Valentine’s Day message on the 3rd panel. This is cut out with a circle from the Layering Circles framelits and is layered on a larger scallop circle cut from Real Red cardstock. These Love Notes framelits are so much fun. There are a lot of pieces to this set! I cut the cupid’s arrows from scraps of Real Red cardstock and used these to enhance the Happy Valentine’s day message. Other embellishments are rows of hearts that I stamped with real red ink on whisper white cardstock and cut out to l ine the Z panel. The 3D Heart Flowers were stamped with real red ink on whisper white and with white craft ink on Real red cardstock and embossed with white embossing powder. The Heart flowers are cut out with the die that makes them 3D and attached to a 1/8″ strip of cardstock to make a “stem”. These are attached to a 1/2″ x 4″ piece of cardstock that is run from the card base to the front strip so the hearts can pop when the card opens. 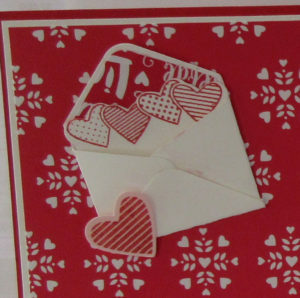 Also included with this framelit set is two small envelopes that you can add Love Notes to. The envelope is a scrap of whisper white cardstock cut using the envelope die. The little love note is a piece of whisper white that I stamped the string of hearts on and cut out with the love note die. The heart on the outside of the envelope is a scrap of blushing bride cardstock with a single heart stamped and cut out with the dies. I added a second envelope in Real Red cardstock with a another love note to the middle panel. This die set is a great way to use up lots of scraps! I made other embellishments from scraps of Red Glimmer paper. 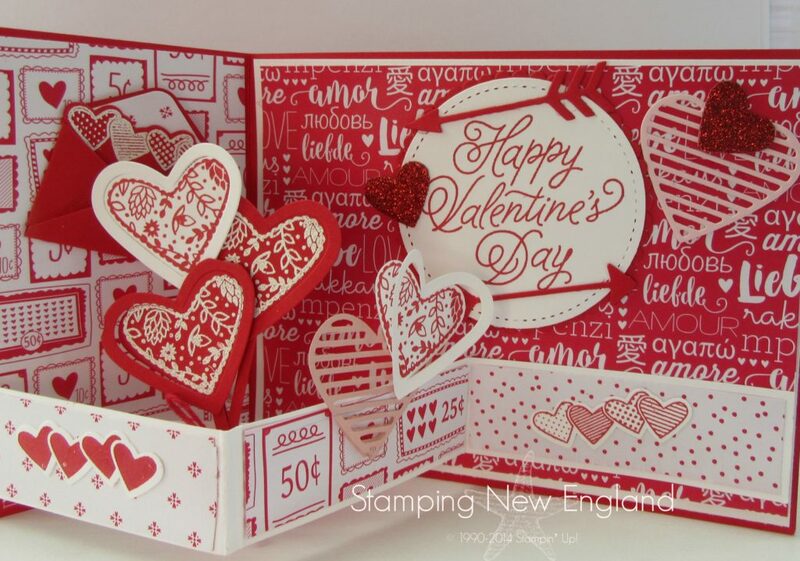 This is my favorite Valentine stamp set that Stampin’ Up! has made in several years! Such a great versatile set! I think that I will make a couple of Wedding and Anniversary cards with this set. Stay tuned for my video which is being edited that shows the details of this card.